Seal Rock Partners is the family-backed private equity investment affiliate of Jonathan and Edward Cohen, partnering with Bill Fradin to acquire and build lower middle market businesses into market leaders. We target equity investments of $10 to $50 million in growth-oriented companies to support consolidations, capital investment, and operational improvements. Seal Rock provides its co-investors an opportunity to leverage the Cohen family’s long history of success as investors and business leaders in companies such as Atlas Energy, Atlas Pipeline Partners, Resource America, Jefferson Bank, State National Bank of Maryland, Fidelity Leasing, The Richardson Company, and others. Jonathan Cohen is the Chairman, CEO, and Founder of HEPCO Capital Management. He is the Chairman of the Board of Falcon Minerals and was also a director of Energen Corporation until its sale to Diamondback Energy. Previously, he was CEO of Resource America prior to it being acquired by C-III Capital Partners. Jonathan also co-founded both Atlas Pipeline Partners, which was sold to Targa Resources, and Atlas Energy, which was sold to Chevron Corporation. He co-founded the general partner of Arc Logistics Partners and served as Chairman until it was sold to Zenith. His philanthropic endeavors include his positions as Chairman of the Executive Committee of Lincoln Center Theater, a Trustee of The American School of Classical Studies in Athens, Greece, and a Trustee of Arete Foundation, a private family foundation. Jonathan holds a BA from the University of Pennsylvania and a JD from the American University School of Law. Matthew R. Zubrow is an Associate at Seal Rock Partners. Prior to joining Seal Rock, Matt was an investment banking analyst at Evercore Partners. Matt holds an AB with Honors from Dartmouth College. 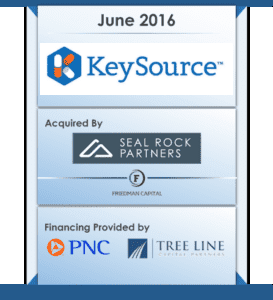 Seal Rock Partners joined with the former leaders of Harvard Drug and Anda to acquire KeySource USA as a leading platform for healthcare distribution in 2016. KeySource was founded in 1996 and has been catering to the generic pharmaceutical needs of retail drug stores across the United States since 1996. Headquartered in Cincinnati, OH, our investment team brought in longtime generic distribution executive Albert “Al” Paonessa as CEO to help lead the Company to its next level of growth. KeySource has benefited from his three decades of industry experience. Seeking add-on acquisitions across the Healthcare industry. Seal Rock partnered with the former management of Harvard Drug and Anda to acquire KeySource USA as a platform company in healthcare distribution. KeySource USA was founded in 1996, and has been catering to generic pharmaceutical needs of retail pharmacies across the United States since 1996. It was formed by Stephanie Ring and is headquartered in Cincinnati, OH. CEO Todd Szewc has over 10 years of experience with KeySource USA and remains as leader. He is a specialist in generic drug distribution with extensive relationships with drug manufacturers and independent pharmacies, long-term care facilities, and other retail distributors. KeySource purchases ALL products it sells directly from FDA approved manufacturers, and hence is a trusted wholesale distributor of generic pharmaceuticals. KeySource takes the responsibility to safeguard the integrity of the pharmaceutical supply chain seriously, securing it against counterfeit or adulterated products. Founded in 2017 and based in Portland Oregon, Modern Adventure is an innovative experiential luxury travel provider that selects renowned tastemakers, including craft brewers, winemakers, restaurateurs, hoteliers, and chefs to design and lead life-changing journeys across the globe. Modern Adventure partners with mission-driven companies to bring brands to life through curated, immersive travel experiences. Seeking add-on businesses in the following areas: Tour operators, online travel agencies, content creation agencies, travel management, experiential brands, and destination management companies. SRP partnered with EOS Partners to invest in Consolidated Analytics (“CA”), a growing tech-enabled service provider to the mortgage industry. Our investor group backed CA’s acquisition of Carrington Property Services (“CPS”), the captive mortgage services unit of leading real estate conglomerate Carrington Holding Company (“CHC”). CA is led by an accomplished team of experienced executives and entrepreneurs with strong industry relationships and a proven track record in the BPO mortgage services space. Largely focused on the secondary mortgage market, the Company has contracts with a growing list of blue chip clients and its current offerings include valuation, consulting, due diligence, REO asset management, and rental management services. We are seeking to expand the platform with bolt-on acquisitions, particularly to augment CA’s tech-enabled capabilities and broaden its range of service offerings. Full-service provider of mortgage services to the primary and secondary markets. Founded in Madrid in 2015 by famed Esports player Carlos “Ocelote” Rodriguez and noted Esports investor Jens Hilgers and currently based in Berlin, G2 has assembled a premier team of Esports professionals and is highly competitive globally across the most prominent industry titles. Seeking to make additional venture investments in the Esports ecosystem across game development, sports betting, analytics, and peripherals.